- Other fixed installations (shops, shopping malls, airports, etc.)². ² only PSUT1 speakers and PSUTS subwoofers. Created by the Peecker Sound design team - consistently at the forefront of professional audio system design for large public venues -, the Upturned T series is an innovative and radical audio solution compared to the traditional way of conceiving sound reproduction. The series consists of two column speakers (PSUT8TE and PSUT8AE), each equipped with eight 4" full-range loudspeakers, the PSUTBASE/A active subwoofer, the ideal base for amplifying up to two column elements thanks to the plug&play connectors, the single PSUT1 module and its companion dual subwoofer PSUTS, the last two being the perfect solution for background music or for sound reinforcement in smaller venues. The PSUT8TE unit (Top Element) is a 98-cm tall column speaker with a power handling capacity of 400 W RMS, designed for sound reinforcement in contexts requiring a long throw and good intelligibility, including multimedia installations for shows and exhibitions of various types, as well as multi-purpose halls, convention and trade fair centres, cinemas, places of worship, but also in entertainment and performance venues. This type of speaker is truly unique and special, thanks in particular to the ingenious layout of the transducers that creates hybrid coverage: the first four loudspeakers from the top easily reach the far field thanks to a sound level decay typical of arrays (Max SPL at 16 m is a full 107 dB! ), while the next four - oriented at angles determined by an in-depth physical-acoustic study - are directed towards the audience closest to the speaker, at about 2-3 metres distance. The PSUT8AE unit (Additional Element) is designed to be positioned between the base (the amplified subwoofer, see below) and the top element to create acoustic continuity between the two elements. It has the same power handling capacity as the top unit (400 W RMS), but it has a shorter throw while, at the same time, a wider horizontal opening. Using this element increases the availability of the mid-low frequencies and is essential for voice and solo instrument reproduction. It is important to note that this speaker has a plug-in connector also in the upper part, enabling the connection of additional speakers (up to four), all without the need for a power cable or external signal. Summarizing months of research in just a few lines, we can affirm that the real "supporting evidence" for the two column speakers described above, besides the well-known properties of a very long array, is the exceptional horizontal dispersion - a full 150°. This is achieved thanks to the special mixed arrangement of the various transducers (multi-angular loudspeaker design), a solution devised by the Sound Corporation R&D department following measurements and simulations carried out with dedicated predictive software applications. The PSUTBASE/A self-powered subwoofer (800+800 W RMS with a powerful DSP on board) can drive up to two stacked column elements, which are connected to the subwoofer by means of a solid hooking system and a connector that excludes the need for any external cable. The "top" configuration - 1 PSUTBASE/A + 1 PSUT8AE + 1 PSUT8TE (the emblematic Upturned T: ⊥) - adapts perfectly to the audio needs of bands and musical groups (with incredible performance for musical genres such as blues, jazz, and unplugged pop), acting as both main P.A. and stage monitor, and producing powerful and crystal-clear sound for audiences of up to 150-200 people. Moving on to the other products of the line, the PSUT1 is a light-weight, compact and modular micro-speaker, only 13 cm wide, designed specifically for sound reinforcement in pubs, restaurants, bars, shops, museums, public buildings and the like. It can be used in cluster configuration up to four elements that are interchangeable and can be oriented horizontally or vertically as desired. Coupled with the PSUTS dual subwoofer (equipped with two 6" loudspeakers in bass reflex configuration), it produces a soft sound with extended frequency and perfect loudness, indispensable for the low sound pressures required in these environments. “The key objective behind the design of this innovative product was to have a portable array with a long throw (over 15 metres) and outstanding horizontal coverage capability: and indeed, the 8 aligned speakers, arranged according to a multi-angular loudspeaker design, provide coverage of 150° and SPL at 16 metres is as high as 107 dB. The individual modules with dedicated sub are remarkable". ² only 4008 or 4010MH speakers. Planned and produced to celebrate the 40th anniversary of the Sound Corporation group, the ambition in designing the Forty series was to offer affordable products that feature cutting-edge speaker design and production technology usually found in the price bracket of much higher-end products. 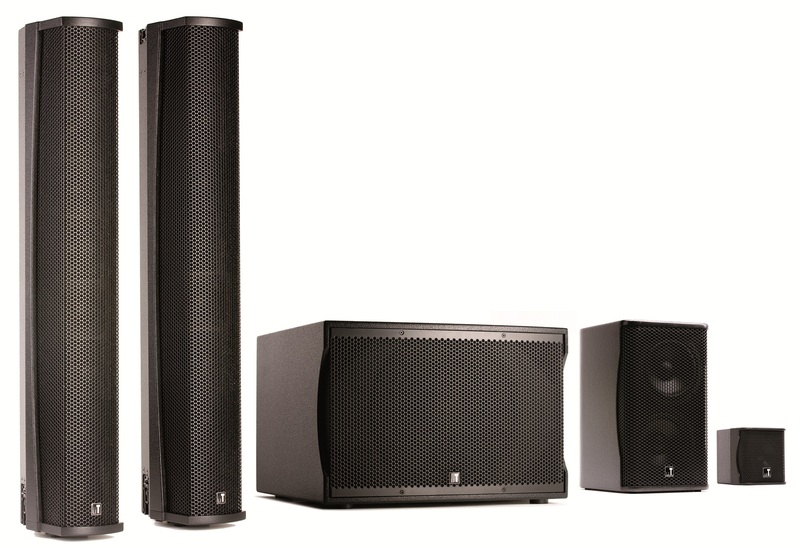 The series comprises seven different models: five 2-way speakers (models: 4008, 4010MH, 4012MH, 4015MH and 4030MH, the last three also available in self-powered version - 4012MH/A, 4015MH/A and 4030MH/A) and two subwoofers, both passive (40SW15 and 40SW18 models) and active (40SW15/A and 40SW18/A models). The 2-way loudspeaker systems are designed for sound reinforcement to cover medium to large-size listening areas homogeneously and uniformly. With these systems, the voice is perfectly intelligible and is not modulated by low frequencies even at a distance and on an angle falling within the values of dispersion. The transducers (Neodymium woofer, Mylar driver) are the best and most technologically advanced in the audio industry, and the same goes for the digital electronics with DSP in the active versions and crossovers with shielded resistors in the passive versions. But the real added value of this line of products lies in the innovative aluminium horn (in fact, the abbreviation "MH", which stands for "Modelled Horn", appears in the name of the models), specially designed in the Sound Corporation research laboratories and registered with the acronym A.W.S.H® (Acoustic Wave Shaped Horn). This horn, made of aluminium alloy, has variable thickness (it narrows by moving towards the "mouth") to minimize resonances, whereas the driver is equipped with a central phase plug with inverted dome. The coaxial structure of the two mid-high frequency sections makes it possible to reduce phase distortions and makes the polar diagrams even more controlled; in fact, the angle of sound dispersion remains constant over the entire spectrum reproduced, and consequently the frequency response is linear over the entire solid angle, providing uniform coverage of the listening area. The Class D power amplifier onboard the self-powered models, weighing just 0.5 kg, is produced entirely in switching technology and contains a powerful DSP (24 bit / 96 kHz) with 2 presets that can be selected using the push button on the panel on the back of the speakers. The shape of the birch plywood cabinet has been optimized to reduce standing waves inside the speaker to a minimum and to facilitate the use of side-by-side systems. In addition, the two different angles of the cabinet of the satellite models 4012MH and 4015MH allow them to be used correctly as floor-standing monitors. The extremely compact dimensions facilitate transport, a pole mount with dual angle enables easy installation on stand holder, and a complete line of accessories assures quick and safe suspension. The subwoofers of the Forty series are band-pass type, in which the radiation of the loudspeaker does not take place directly, but by means of two resonance cavities, one front and one rear. In this way, maximum efficiency is achieved in reproducing low frequencies only, without interfering with the other components of the system. Thanks to the special configuration, the membrane of the loudspeaker is subject to much less movement compared to traditional reflex systems, thus producing a strong reduction in distortion even at the maximum power. The cabinets feature a very sturdy structure with special reinforcements that cancel any form of parasitic vibrations and are protected with a special scratch-proof polyurethane paint. The protective grilles, "transparent" to the sound reproduced, are crash-resistant. “The real strength of this speaker series is the fact that it offers top class professional products (thanks to the internal components, the passive crossover, the dual tilt pole mount, etc.) within a highly competitive price bracket. Designed for Sound Corporation's 40 years in the audio business, this has become a benchmark series". - Other fixed installations (shopping malls, shops, airports, etc.). 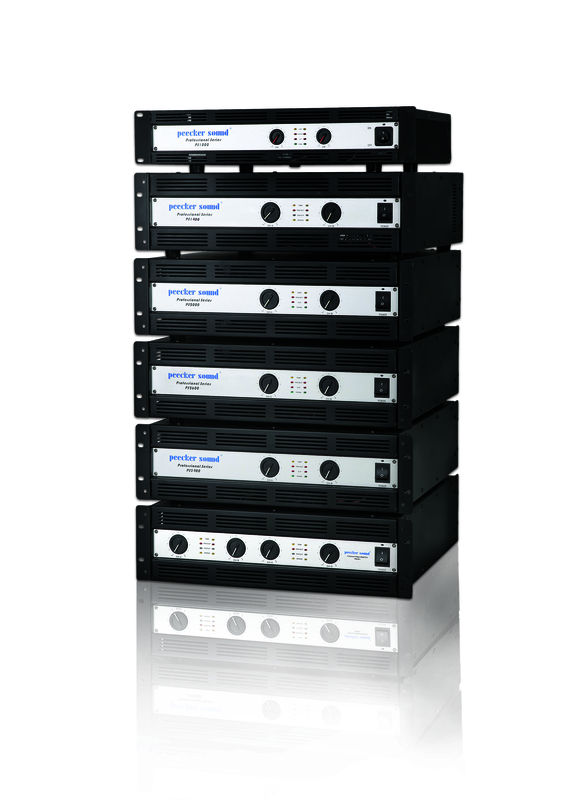 The PS series amplifiers are designed to respond to the specific needs of professional audio that are based on the criteria of maximum reliability and functionality. The amplification stages of each single channel are housed in interchangeable modules that can be easily installed in or removed from the main rack, thanks to the electrical connection using wiring with removable connectors. This enables the immediate replacement of the power stages in the event of a malfunction. The units are equipped with forced-air ventilation, which is automatically activated when the temperature climbs higher than 60°C. All the amplifiers of the series are characterized by a special electronic configuration which, at the same output power, is subject to less dissipation, with consequent lower consumption compared to other products of the same market segment. The devices also feature an internal limiter that can be disenabled by means of a dedicated jumper, as well as protection against short circuits, overloads or excessively high temperatures. In addition, all the PS series amplifiers include anti-bump circuitry and DC fault protection on the output to prevent damage to the connected speakers. The PS266 Speaker Management Processor is a true "intelligent" controller, the state of the art in professional audio. The PS266 allows the user to configure the reproduced sound using 60 presets, factory-installed or downloadable by the user from external PC or panel, and obviously performs all the typical audio functions (EQ, frequency cuts, etc.) for conforming and optimizing the response of the speakers to the user's needs in the specific listening environment. The processor comprises a digital electronic device with crossover filters with slope of up to 48 dB/oct that makes it possible to manage systems in multi-amplification up to 6-way mono or 3-way stereo. The device is equipped with a LED bar graph for the input section with step indication of the input level (-30 dB, -24 dB, -6 dB, -3 dB) and with the LIMIT and CLIP strings indicating the moment in which the signal reaches or exceeds the applicable threshold or when there is excess gain or EQ on one or more outputs; the LED bar graphs for the output sections provide the same indications referring to the limiter threshold set for each output. An encoder knob situated on the right of the display is used for fast switching access to the various menus and for modifying the system parameters and/or setting the inputs and outputs, as well as selecting from the 60 user memories one of the presets previously uploaded from PC. • programmable from front panel or from PC via easy-to-use graphical user interface (GUI). “With the PS series we've achieved the best cost/performance trade-off for fixed installations. The undisputed quality of these class AB amplifiers, the high reliability and solidity of the oversized components - supported by the handling capacity and user friendliness of the "intelligent" PS266 digital processor - are exactly the result we were striving for".